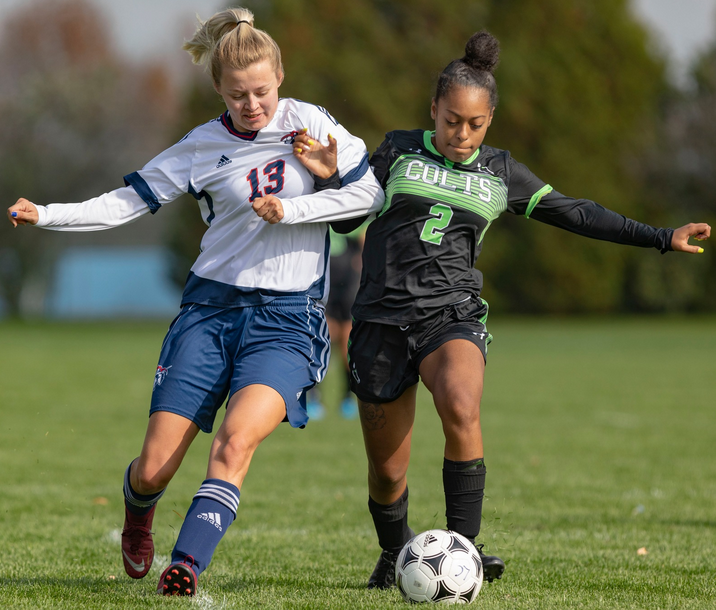 BELLEVILLE – Her team’s final game of the season is done. Lindsey Anderson stands on the field watching her five-year-old son, Owen, race around the grass, darting between his mother and grandmother. Anderson, who is from Trenton, is a forward on the women’s soccer team and a second-year student in the recreation and leisure services program. On top of being a parent and student athlete, Anderson is also the health sciences leader on the student government. She said that juggling her responsibilities can be tough. “Once you get a schedule down, you have to stick to it. You can’t say, ‘Oh, I’ll just do homework later.’ No, later is soccer practice, and then after that it’s putting the kid to bed or eating,” she said. 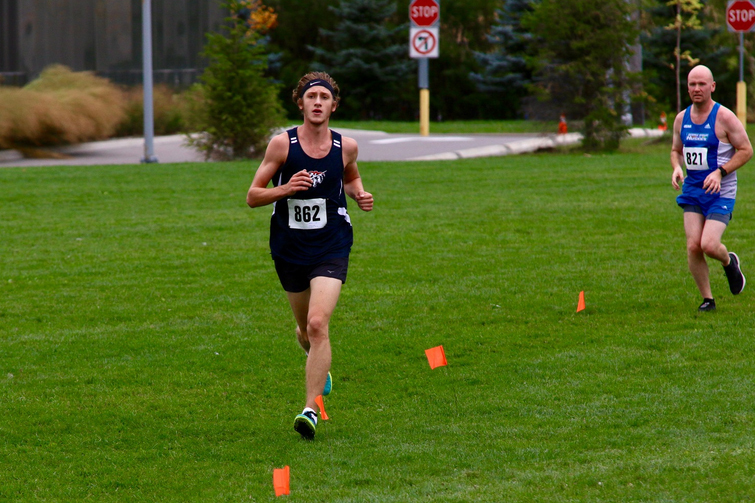 There are about 115 varsity athletes at Loyalist College this year, said the school’s athletic director, Jim Buck. They are students who are trying to balance the demands of sports and full-time studies. Student athletes must be registered as full-time students and be in good academic standing to attend practices and compete on varsity teams. They must maintain a minimum average of 60 and pass all their courses, Buck said. The school’s varsity teams consist of men’s and women’s basketball, cross-country running, rugby, volleyball and women’s soccer. Anderson said her teammates have made everything worth it. “Instead of having friends in just your course, you have friends all over the place that might know things that can help you throughout the school and throughout the athletics department and everything else. You make a lot more connections and they’re not just in your field,” said Anderson. 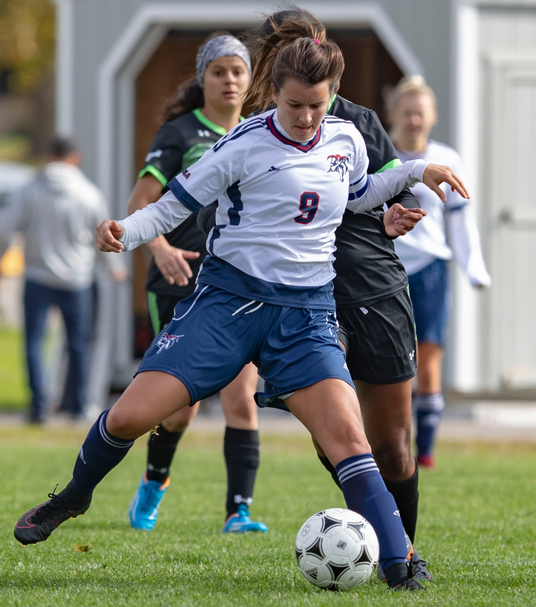 Emily Osmond of Trenton, a midfielder on the women’s soccer team, balances her schoolwork, sport and her full-time job as a probation officer in Belleville. This is her first year at Loyalist, having completed four years at Bishop’s University prior, and she is enroled in the developmental services worker distance program. “It’s tough, it’s always tough,” she said. “I feel like I’m just trying to get everything done on time and then still manage to eat right and get all that exercise in, get to practice on time, and then not even just being on the ball but being a good teammate, too, and making sure you’re supporting everybody else,” said Osmond. The bonds she has built with her teammates have helped her feel welcomed and supported, she said. “You’re a family. You’re together all the time, you suffer on the field, you suffer in practice but you spend time together that you don’t normally get with your co-workers; it’s a different type of relationship,” she said. Bobby Buck of Belleville is a first-year student in the recreation and sports services program and the son of Jim Buck. He works part-time at the school’s fitness centre and plays on two varsity sports teams: basketball and cross-country running. Buck often has basketball and cross-country running on the same day and spends about 12 hours at practices each week between both sports, he said. But he said he always has fun, especially on game days. “It’s a very positive atmosphere around our student athletes, so it’s a very fun thing to be a part of. Loyalist does a very good job at taking care of their student athletes,” said Buck. 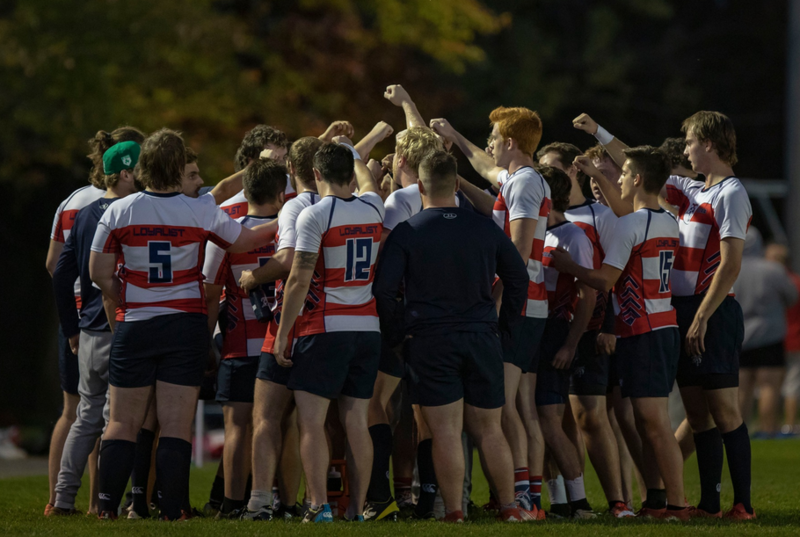 Members of the men’s rugby team, who played their final home game of the season Wednesday against the Durham Lords and suffered an 81-5 loss, also talked about their need for good time management. Blakely Maracle of Frankford plays centre and fullback and is in his final year of the fitness and health promotion program. He volunteers at high schools where he helps coach football and had a part-time job at the start of the semester at Parks Canada as a student operating assistant on the locks on the Trent-Severn waterway, he said. Maracle enjoys the comradery among his fellow players and getting recognized in the hallways as a member of the team, he said. He often talks about his most recent matches with people who may not be familiar with the sport but who “like to come out and support the school,” he said. Adjusting to the new school schedule at the start of September takes time to get used to, said Maracle. But he said varsity athletes are well-supported by the school’s faculty, who recognize the challenge of excelling at both school and sports. “The hardest part of balancing it is when you get multiple assignments at once, and that’s where the school really steps in and helps out. On numerous occasions, I’ve had to get a day extension or even just a couple hours in order to get the extra stuff done,” he said. Devin Adams of Belleville is a second-year student in the fitness and health promotion program who plays the position of lock. Despite his responsibilities and upcoming placement, he said he is looking for a part-time job. “It’s a challenge, but the more dedicated you are to both school and the sport, you find that balance,” he said. “I think the most rewarding part about being a student athlete is kind of the pedestal that people put you on. It makes it that much more challenging to live up to those expectations,” said Adams.